Sometimes, people who save the world need a break. A team of five heroes decided to join a strategy game tournament and see who will get the farthest. A mysterious person, however, decided to enter the tournament as well. Who is this man and what does he want? Perhaps, this is not just a tournament. Strategize your capitalistic powers and wipe out everyone's armies. You use your mouse for everything. A tutorial mode is available for learning the mechanics. "There's so much to talk about this game! I don't even know where to start! I mean, this all started when I showed Great User Wars in class for some Science Fair Project even though it had no relation to the project. Then some dude named Edward, approached me and asked me to make a strategy game for him. I forgot what game he told me to base it off of, but this is the first time I made an AI that can actually think a little. This game makes me happy because it reminds me of when that Edward dude was so into Nazis and stuff. I still play this game sometimes to kill time. It looks like a mess but I think it's fun. Even my maid, who I kinda made a playtester, said it was fun, despite not being very interested in games. I was even surprised she was able to beat the broken Edward in one try. In the end, this game brought me closer to Edward and I soon found out that a few of his acquaintances are interested in fighting games. Soon enough, we formed the Secksmen, which is a novice fighting game crew. We don't compete as much anymore but it's like a friendship for life. It's funny how we were all in the opposite sides of the cafeteria, then we all ended up in the same table. Now we're back being in the opposite sides, but now it's the earth this time. We're far apart, but we're still homies. Wait, this ain't about game development anymore! But yeah! I love how this game had a turn of events like this! This game was made as a request by someone named Edward, which is also a character in the game. Upon completion, the team gave Edward the game not just through a CD, but a CD enclosed with a case featuring a strange cover art. The CD includes the game and Gears of Awesome. This is the first game to feature the Final Flames cast with more fleshed out personalities. This helped Faliyos the most as his dialogue barely shows any emotions in the first game. 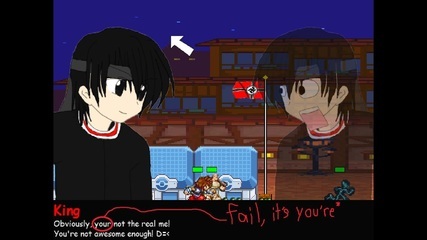 This game is also the first game to have Naira talking, in which her obsessive yet loving personality makes a reference to why she was first labeled as a typical stalker enemy during the development of RPG Tournament. If Chair never distracted one of her high school classes by screaming the importance of lolis during the lecture about reproduction, this game would have never been made. Edward approached Chair due to his curiousity of people with strange personalities. Once Edward found out that Chair makes games, he requested this game to be made. This game was based off a strategy game that I forgot about. 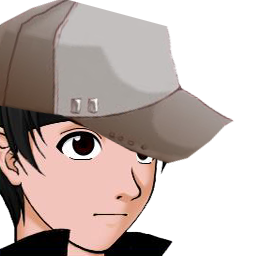 Chair planned to have King wear a hat to hide his identity in the tournament but that was scrapped and the hat was given to Edward. The CPU actually does not have a long wait time for buying stronger units. This was done for balancing out the difficulty of the game, as it was harder to develop a smart AI in a strategy game. This means that during development, having the same wait time as the player made the game too easy. A comic was made after development where Edward forgot to evacuate Joriel during the huge explosion near the end. If Alen was in this game, Mr. Prez would have wanted him to have Samus as his shooter. Edward named this game Dirge of the Fallen, even though he didn't know what dirge meant.